Located in Tumwater, WA, The Hampton Alzheimer's Special Care Center is a residential option for those seeking elder care solutions. A member of the JEA Senior Living family of centers, The Hampton offers a compassionate and comprehensive, individualized senior care design, combining assisted living with one-on-one dementia and memory care. In addition, The Hampton Alzheimer's Special Care Center offers respite Care, serving families and caregivers throughout the region. The Hampton model incorporates each individual resident's unique life story into its care approach. Utilizing our distinctive Meaningful Moments® approach, The Hampton Alzheimer's Special Care Center team provides a warm and meaningful assisted living environment. The partners in care relationship we encourage with resident families and friends is invaluable. 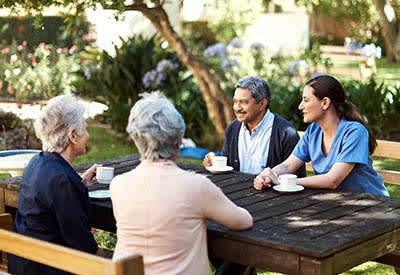 Our unique approach benefits from this relationship as familiarity and appreciation of each resident's life experience and background provide a vital link in successful memory care management. The national family of JEA Senior Living centers includes over 40 locations, with The Hampton Alzheimer's Special Care Center as one of the newest "siblings." Embracing the organization's mission to "honor the experience of aging," we are compassionately committed to the knowledgeable and comprehensive health treatment of our residents. Below is additional information about the services offered at The Hampton Alzheimer's Special Care Center.